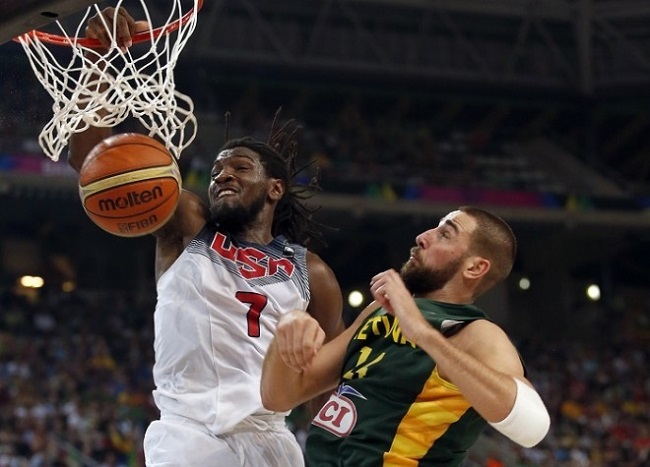 Kenneth Faried dunks the ball during Team USA’s World Cup semifinal win over Lithuania. Kenneth Faried scored 12 points and grabbed seven rebounds in Sunday’s gold-medal game at the FIBA World Cup, helping Team USA rout Serbia 129-92 in Madrid, Spain, to win the tournament formerly known as the World Championship and secure an automatic spot in the 2016 Summer Olympics. Faried, a practicing Muslim who plays power forward for the NBA’s Denver Nuggets, was named to the World Cup All-Tournament Team alongside USA teammate Kyrie Irving, France’s Nicolas Batum, Spain’s Pau Gasol and Serbia’s Milos Teodosic. He now ranks No. 2 on the Team USA all-time list for rebounds in a single tournament after pulling down 70 rebounds in the World Cup. The Americans finished the tournament with a spotless 9-0 record, and none of their games were really close. Their average margin of victory was 33 points per game. It was an easier than expected run to the title, as some thought the U.S. would be hurt by the absence of NBA superstars like LeBron James, Kevin Durant, Chris Paul and Kevin Love. Irving, who will play with LeBron and Love next season as a member of the Cleveland Cavaliers, scored 26 in the gold-medal game, while James Harden of the Houston Rockets added 23 points. Irving was named World Cup MVP.